Like any road-ready vehicle, your RV’s tires are a crucial element in getting you and your family from point A to point B. The integrity of your motorhome’s tires not only ensures safety on the road, but can even influence its efficiency on a variety of levels. Proper inflation is one of the easiest ways to get the most out of your tires. Too-high or too-low air pressure is the number one cause of tire failures on the road, as it causes erratic wear that results in weak patches on the rubber. 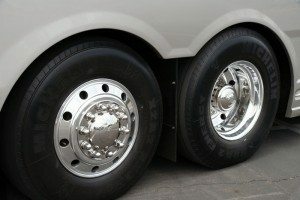 When your RV’s tires have inadequate air, they are more likely to overheat or blow out, and can even increase required braking distance and reduce steering and handling capability. Aside from safety implications, research shows that tires underinflated by just 10 percent lost up to 16 percent of their tread life, and those underinflated by 30 percent reduced the vehicle’s fuel economy by as much as 10 percent. At the same time, over-inflating your tires can have just as many negative repercussions, causing rapid tread wear and reducing the effectiveness of your shocks. All in all, keeping your RV’s tires properly filled at all times will save you time, money, and worries along the way. How much should I inflate my tires? While the amount of pressure your tires need is largely dependent on their size and capacity, the basic process can be applied across the board. Begin by finding your RV vehicle and axle weight ratings, which can usually be found near the driver’s side door. Typically, your vehicle’s rear wheels carry more weight than the front wheels, meaning the rear set will need slightly more pressure than the front. On the weight ratings, you’ll see three numbers: the Gross Vehicle Weight Rating (the combined weight of both axles), and the Gross Axle Weight Ratings (one for each axle). These numbers will give you a good place to start, but there are a few more steps you need to take to make sure you’re being as accurate as possible. Since these numbers are an estimated weight, it’s wise to weigh your motorhome with the addition of any luggage, fitness equipment, or other amenities you usually take on your trips. Be sure to fill up your tanks with water as well, as this will dramatically change the weight your vehicle is carrying. Find the nearest scale to weigh your rig (typically, one used by truckers will do the trick), and compare these numbers to the manufacturer ratings to make sure you’re not over the maximum capacity. Once you know how much your RV is carrying, you can determine the proper inflation pressure for your tires. Begin by locating a load and inflation table for your brand and size of tires (a quick search on the internet should turn these up). Divide the weight for each axle by two to find the load for each tire, and compare it to the PSI usage number on the chart. You may want to inflate them slightly above the exact match on the table to compensate for uneven load distribution, but no more than 5 PSI each. Now that you know how much each tire should be filled, you can verify the current pressures and add or release air where necessary. Be sure to check your RV’s tire pressure at least once a month, and more often if you experience dramatic shifts in temperature, as this can affect air levels. 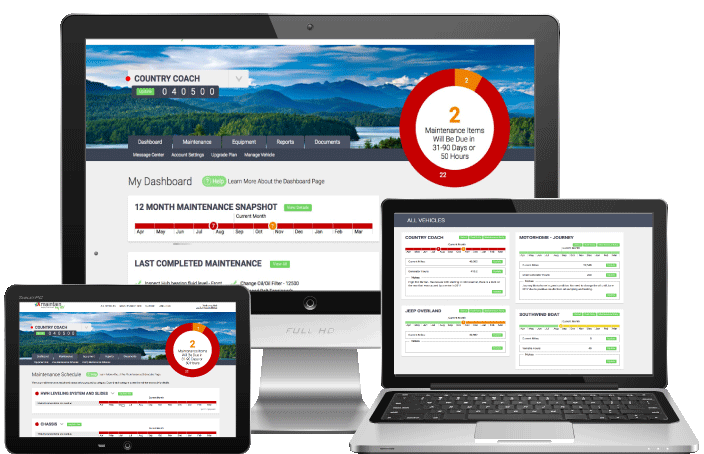 To help ensure timely upkeep of your vehicle’s tires, check out Maintain My RV, where you can access online maintenance solutions, schedules, and checklists for all of your motorhome’s needs.